Here’s a great recipe to use all those leftover Easter eggs! It’s one of the many great dishes the BF and I enjoyed this weekend in Tahoe. We ate a completely Paleo Easter dinner on Saturday evening, and day by day I will be sharing everything we had and how to make it! To prepare the beets, cut them into cubes and boil them until they are tender. They will slip out of their outer skins much easier after they cook. Cut into little “diamond” shapes and set them aside. Hard boil the eggs and peel them out of their shells. Cut them in half and scoop out the yolks into a small bowl. Cut half an avocado and mash it together with the yolks in the bowl. Add the spices and garlic puree and the salt to taste. Spoon the mixture back into the egg white halves. Top with cracked pepper. Garnish the finished eggs with the beet diamonds. Tomorrow I will show you how I made a Gingersnap crusted ham Paleo style! This entry was posted on April 9, 2012 by cavegrrl. 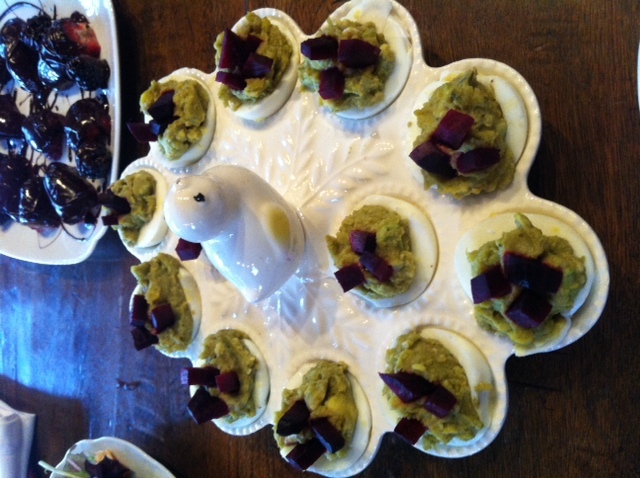 It was filed under Easter, leftovers, paleo, primal, Recipes .